The mistake of the Percy Harvin trade cost the Seattle WR Golden Tate, who left in free agency for Detroit, where he’ll see the Seahawks Sunday. They haven’t recovered. Of all the players who have moved on from the Seahawks championship team to other NFL outposts, WR Golden Tate was the most costly departure. Combining Tate with Doug Baldwin from 2014 to 2018 would have been a tandem to put wrinkles in the brows of defensive coordinators and a smile on the face of QB Russell Wilson. In the New England Super Bowl, Wilson maybe throws to Tate instead of Ricardo Lockette. The decision to not give a second contract to Tate, who signed in free agency with Detroit, where the Seahawks play Sunday (10 a.m., FOX), perhaps one day will be usurped in futility by Richard Sherman, should he be healthy enough to star in San Francisco. Whatever the ranking, the cost of Tate’s loss was amplified by the reason for it: The trade for WR Percy Harvin. To use football parlance, a double move, of badness. The post-championship arrival of the mercurial Harvin, who recently admitted to a long-term anxiety disorder that basically got him thrown off the Seahawks in October 2015, was the catalyst for the decision let Tate go into free agency after 2014. They decided they wouldn’t pay big money to both at the same position. To borrow from the knight in Indiana Jones and the Temple of Doom, they chose poorly. In Seattle from 2010-13, Tate caught 165 passes for a 13.3-yard average and 15 touchdowns, rushed 13 times for 69 yards and returned 68 punts for 787 yards. He missed four games. In Detroit from 2014 to 2018, he has caught 409 passes for an 11.5-yard average and 22 touchdowns, rushed 28 times for 136 yards and returned 24 punts for 187 yards. He missed no games. In other words, a startling consistency. Harvin, meanwhile, was dispatched by Seattle, for whom he played six regular-season games, to the New York Jets, where he played seven games. Then he played eight games with Buffalo before retiring at 28. To get Harvin, the Seahawks gave Minnesota a 2013 first-round pick, a 2013 seventh-round pick and a 2014 third-round pick, and gave Harvin a six-year, $67 million contract that included a $12 million bonus at signing. Tate, meanwhile, received a five-year, $31 million free-agent contract from Detroit. In the deal’s final season at age 30, Tate is getting $9.3 million, fourth-highest on the Lions roster. But given his levels of consistency, versatility and productivity, it’s a steal. In a season in which rookie RB Kerryon Johnson has given the Lions a real rushing game (6.4 ypc, second in the NFL), Tate is leading the 3-3 Lions with 37 receptions, 465 yards (12.6 ypc) and three touchdowns. He’s 12th in the NFL in yards after catch (232). Tate is also 12th among active NFL receivers in career receptions (574), Baldwin 25th (455). Tate was also perhaps the best downfield blocker Carroll’s Seahawks have had. Together, Tate and Baldwin would have saved the need for the Seahawks to use a second-round pick on Paul Richardson (gone in free agency) and a third-rounder on Amara Darboh (injured reserve). If you care to place a pin on the Seahawks’ timeline of where things began to get sideways, Harvin over Tate is where it goes. Yes, hindsight is 20/20. Then again, it’s all we have. At least Carroll didn’t sound bitter about it. Regrets, Pete? “I don’t mind saying that,” he said at his weekly Wednesday presser. “I think Golden is a great player. I loved the way he played as a young guy coming in. He always had a knack. He was such a naturally competitive, kind of athletically artistic type of guy. He could make you miss and break tackles and do things that a lot of guys didn’t do. In Seattle’s offense, Tate would not have the same targets and receptions as he has had in Detroit. So even if Seattle had matched the Lions’ offer, he may have rejected it. But if Harvin had not been acquired, Tate not only would have avoided a pre-Super Bowl fistfight with the guy, he may have earned a bigger role. The what-ifs won’t change anything about Sunday, when, one game after seeing Marshawn Lynch in London, they meet another lord of the Super Bowl ring. LB Bobby Wagner sounds as if he will offer a polite hello before hoping to meet Tate on a crossing route. “You definitely stay in touch,” he said. “You always want to see a guy do well. When I see the Lions come on (TV), I root for Golden. But when he plays us, I hope he gets no catches, no yards and he gets hit a bunch of times. Because of the salary cap, every NFL team has to make hard choices regarding top talents in their primes. But in the Seahawks case, the over-reach for the spectacular but troubled Harvin exceeded the appreciation of the grasp they had with Tate. It’s taking years to get over it. Why don’t folks understand the difference between could and couldn’t in “care less?”….Anyway, the stats don’t lie, but it seemed like Tate was sent packing in part because he was a disrupter (as was Hardin). As a fan, I felt the Kearse loss much harder. Tate wasn’t a disrupter, unless you think seeking market value for your services is disruptive. The English language is going the way of the rotary phone. As they do for all. But the Seahawks weren’t desperate. They just won a Super Bowl. They picked him up that year. They believed they needed a difference maker on offense and two more pass rushers to get it done. Thanks Art! You are soooo right. I was excited when we drafted Tate, and when he made the team via special teams. He was a stalwart receiver – absolutely dependable – not unlike his current teammate, Luke Wilson. Good things always happened when Golden had the ball – and great things were a potential – he would not fail you and could make the best out of a bad situation. Harvin is almost like the play that cannot be unseen – and another “?” as to what Carroll & Schneider were thinking, along the lines of ejecting Max Unger for Jimmy Graham. Crazy stuff! It took almost two seasons to get Tate into the NFL game. PC and coaches had to have patience with him. What he learned made him a Pro. Sidney Rice had a lot to do with it. Looking at all of the draft choices given for Harvin, I have a hard time thinking of any player ever that’s been worth that much. He was already a risk with the outstanding issues he’d had as a Viking. Guess everyone has lessons to be learned, including Seahawks brass. Imagine what could have been done with those picks, especially since personnel savant Scot McCloughan would have been around. Sure, Might not have had all the pot holes to fill the last few years. Good points about Rice, and about needing a year. As to risk-taking, look at Belichick taking a risk with Josh Gordon. Huge talent who will work out until he blows up. JS/PC are aggressive risk-takers.They have hit more than they’ve missed, but the misses are always remembered more vividly. Human nature. Still baffles me as to why Harvin and Tate would be fighting each other prior to the Superbowl. . do you suppose we’ll ever know why?. . There are some wild rumors out there which I’m sure you may have heard Art, though I’m guessing nothing provable. . something about Russell Wilson’s wife at the time? Meh. . I feel a bit slimey bringing that up. Yet cant help but feel like there is a very juicy behind the scenes tell all book that might be pieced together someday. Probably shameful, but I’d buy it. Percy has problems and he blew up many of locker rooms. He also quit football. Don’t worry about other people’s rumors … Make some of your own. Marital problems happen especially with young couples and then add money ..fame and travel. Yet Tate spent the time traveling with RW not his wife. Rumor has it I’m not really worried about rumors either (my own rumor created as requested). . I just thought it would be nice to access the unrevealed truth behind the scenes. You’ve got to admit there’s a lot happening with this team that would make more sense were the true causes made known. That’s true with every team in every sport. The revelations come only after the principals are retired and no longer fear consequences. Please read the link in the column to the SI.com story. It explains Harvin’s psychological problems, and his temper that always got the best of him. The Tate/Wilson rumors had no impact on why Harvin went after Tate. The one good thing I’ll say about Harvin (not Hardin) is that in the Superbowl game against the Broncos, the Seahawks are up 22-0 at halftime. You gotta believe that in the locker room at halftime, Broncos coaches are stressing, 3 and out, a quick TD, and now it’s a two score game, “let’s go out and shut ’em down!! !” Harvin collects the kickoff (short kick that takes a bounce) and puts a nail in the coffin. Maybe another returner would have done the same thing, maybe the Broncos were done before this… we’ll never know. But psychologically, that had to be a hit in the huevos, and the Seahawks delivered a cathartic long overdue celebration to the Jet City. Aside from that, Golden Tate should never have been let go… if keeping him was even possible. The Harvin KOR is exactly why he was so tempting for Carroll. But that is a “hormonal” response by him that overlooked why Harvin wore out coaches wherever he went. The man needed clinical help, and either didn’t get it, or failed to maintain a course of treatment. I keep on hearing this skeevy refrain about how great Tate is and how we shoulda kept him and everybody misses the one salient Point:Tate was never going to be, in the ‘Hawk’s offense, what he has become in Detroit’s. The Lions have been slinging the ball all over the yard ever since Stafford arrived because he’s a gunslinger and they are a pass-first (very nearly-pass ONLY, for most of his career) offense, so Tate finally got all those balls thrown his way. OF COURSE he looks good with that many targets per game. He’s a GOOD receiver, not a great one, and keeping him (keeping him HAPPY, which would be the real heavy-lifting) and getting results like he’s had in Detroit would have meant changing the entire offense to placate ONE guy. A Pete Carroll Seahawks team is never going to be as pass-dominant as a typical Lions team and Tate would never have been happy – and would have SAID SO because he’s not great at keeping his trap shut and putting the good of the team first – just being what he was here. All this whining about “Golden! Come baaaack! !” is ridiculous. If you want results like he’s producing in Motown, you have to play like the Lions…which isn’t really getting then to the Super Bowl or even the playoffs, now is it? I wish everybody would grow the fug up about this. He’s GONE and he’s in the right environment for the kind of success he was seeking. Putting him back into the Seahawks’ offense would be like trying to grow palm trees in the middle of Siberia. I don’t think everyone missed that point, it’s why I put the disclaimer in my comment “if keeping him was even possible“, Art also makes the same point in the article; “In Seattle’s offense, Tate would not have the same targets and receptions as he has had in Detroit. So even if Seattle had matched the Lions’ offer, he may have rejected it.” What I lament about Tate’s departure is his competitive drive, and supreme confidence. A lot of players claim to have such qualities, Tate wore it on his sleeve. My point was that keeping him would have meant changing the offense to get that production out of him. He is NOT either the route runner, the hands, OR the competitor that Doug Baldwin is and Carroll would have had to take targets away from Doug to keep him happy. There is NO way Pete Carroll walks away from his “Run First” mantra just to keep one player on the roster. So, all that being TRUE, there is just no way any case can be made for having even tried to keep him. That’s why I said I’m tired of reading this irrelevant argument yet again. Art could have just as easily and just as plausibly written, “Odell Beckham Jr, The One Who Needed to Stay In Seattle After His Last Game Here”. Tate did NOT “need to stay” in Seattle. Tate needed to get OUT of Seattle and this wounded lover thing that continues to surface, from both his own sidelong comments about leaving the Seahawks and all the Bromance nonsense from Seattle writers and fans, serves NO purpose except to give writers something to fill space and radio guys some putrid horse carcass to drag up and beat on again. Breaking news, Stephen: Any NFL offense needs more than one or two deep threats. When they are found, rarely do they have as complete a resume as Tate’s, including the return game. WHY is everybody so damned fixated on Golden Flippin’ Tate as the missing piece? Really? THAT is what would put the Seahawks back on top? He’s competitive? Which is what I hear as most of the reasoning. So are a LOT of guys. Where do d’Andre Hopkins and Michael Thomas and Keenan Allen and Adam Thielen and Tyreek Hill types come from? THE DRAFT. Can we not draft and develop talent like that? Have we already? We don’t know but we sure haven’t developed that many. But we already saw what happens when you take a receiver like Jimmy Graham, who comes from a pass-heavy offense, and put him into the Seahwawks’ offense: we wind up forcing the ball to him and trying to make things happen. How’d THAT work out? Carroll passed on Kasen Williams, who has at least as much potential as Tate had, coming out of Notre Dame. Is the receiver position Carroll and Schneider’s Achilles Heel? Can they not unearth receiver talent the way they do linebackers and safeties and corners? Are they fundamentally weak on offense as a whole? They seem to abandon receivers a lot faster than some floundering project like CJ Procise, who has had more second chances than Jimmy Swaggert, but won’t hang in and see what DEVELOPS with young receivers. History suggests that it works. They DID hang onto Paul Richardson, who was pretty much invisible his first two years but later turned into someone who made a mark, both here and for $40Million(!) in DC. 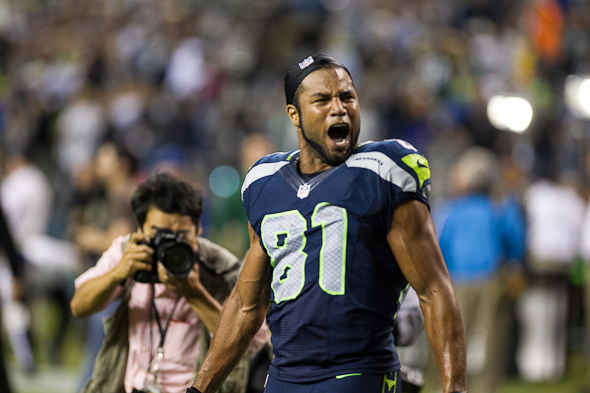 Sorry, but nobody is going to convince me that this grand swoon over Golden Tate makes sense. Was there ever even any real closure on the whispers about Tate and the first Mrs. DangeRuss? Is he in the top ten for receptions, yards, or touchdowns for 2018? NO, according to PFF, he is not. Tyler Lockett is, for touchdowns. Do we take receptions away from Lockett and Baldwin to keep Tate happy? Do we cut off Brown and Moore, altogether, ’cause that’s what Tate’s presence would mean. Golden Tate…Man! I’ve lived in Knoxville and been awash in the Tennesee-Alabama skirmishes for my entire life. I’ve been a UNC basketball fan all that time, too, and went to every Duke game I could manage, before moving out here and four since I did. And I have never seen any fans as irrational as here in sweet ol’ Sea-patch. I think Carroll shares your view bout Tate’s value, and was genuinely dismayed at his departure. But I’m sure our friend Stephen thinks that anyone who agrees is nuts. I think if you read carefully, I was writing about the commitment to Harvin over Tate. The Seahawks invested heavily in a receiver who would have been more demanding and petulant than Tate. So the assumption was the Seahawks were prepared to deal with Harvin’s liabilities. Tate’s liabilities were far fewer. I didn’t say Tate was a great receiver. I said he was consistent, reliable and healthy, with the niche virtue of downfield blocking. He would have made the Seahawks offense better, but would not solve everything. Baldwin emerged after Tate left as a top-end WR, which might not have happened with Tate. And let me know how the fug that talking about player assets and liabilities stunts one’s growth. Baldwin and Tate would have been a helluva 1-2 punch, together for many years. The Harvin and Graham deals are black marks on Schneider’s ledger that will always live on as horrible, and not just for the poor payers they turned out to be but what the Hawks gave up for them, in terms of treasure, draft picks and Unger. Well said and well researched, Art. Like you said, hindsight is 20/20. Too bad PC and JS didn’t have a crystal ball and pay Tate to keep him around. Losing him is a sad outcome. Thanks. No NFL personnel department escapes mistakes. There’s no way for JS/PC to see five years down the road. But it is curious to review after time plays out to see how things work out, in order to inform future decisions. JS and PC just haven’t had a lot of luck with their trades, Harvin and Graham as the poster children. Hopefully with this draft class they have turned that annual state of fan depression around. Did well with Lynch and Brown. I have often wondered if keeping Tate might have prevented the acquisition of Jimmy Graham. I’m not real sure that trade ended up being a success for the Hawks. Who knows how the O line might have performed if Max Unger remained. Perhaps not much better, but I’ve wondered. The Seahawks never received the full Unger out of Graham. Took them three seasons to make Britt a fit at center. Not sure Tate’s presence would have altered the TE landscape. Different gigs. Comicbook Store Guy voice: the knight quoted here is from Indiana Jones and the Last Crusade, not the Temple of Doom.